The most outrageous game Nintendo ever published could have been more outrageous if Nintendo hadn't nixed a couple of jokes, the game's creator, Chris Seavor, said in a recent interview. The game is Conker's Bad Fur Day, which let Nintendo 64 owners control a foul-mouthed but cute squirrel through a series of adventures—many of them movie parodies—while fighting a giant pile of feces and sometimes urinating on a boulder to roll it along. Stuff in CBFD did get censored, whole cutscenes in fact, but on reflection i could see how some people might be offended. Pokemon had to come out, and i was annoyed about that one because it was quite a funny cutscene. Gone forever now. Pretty much 99.9% of the game remained however. Oh yeah, there was a joke at the expense of the KKK, which had to come out too. Hmm, never did understand why Nintendo were apprehensive about offending a group of curiously dressed racists, odd !! Seavor's interview is all tongue-and-cheek and worth a read. 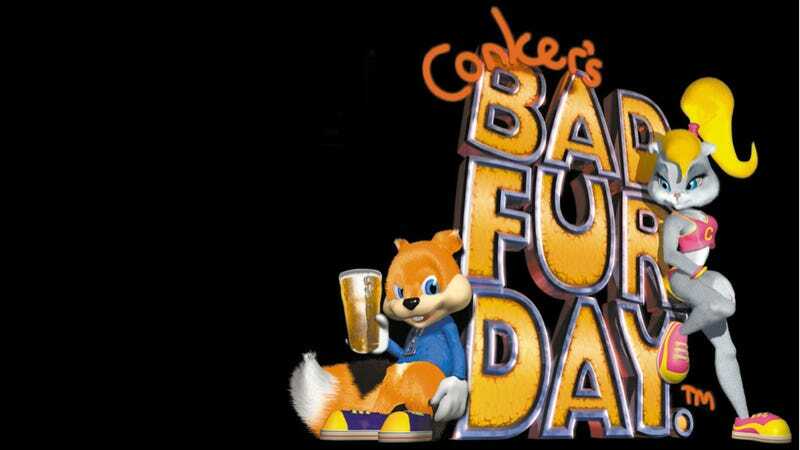 And Conker's Bad Fur Day is worth a play-through on the N64 or on the Xbox where it was re-made, still without those jokes. For a game that was marketed for its toilet humor and parodies, it was surprisingly original and... emotional. Play it. You'll see.